As October continues to bring its seasonal chill, it’s time for GuyStyleGuide to take a look at those essentials every gentleman will need to dig out of his wardrobe before the weather descends any deeper. Be you a mackintosh fan or a trench lover, you’re going to need a durable coat to see you through the harsh rainstorms and snow expected this year. Try to avoid the classic trap of going too thick or heavy; layers are more effective in the cold weather, so use a slightly lighter exterior to circumvent that stuffy feeling when wandering between venues this winter. 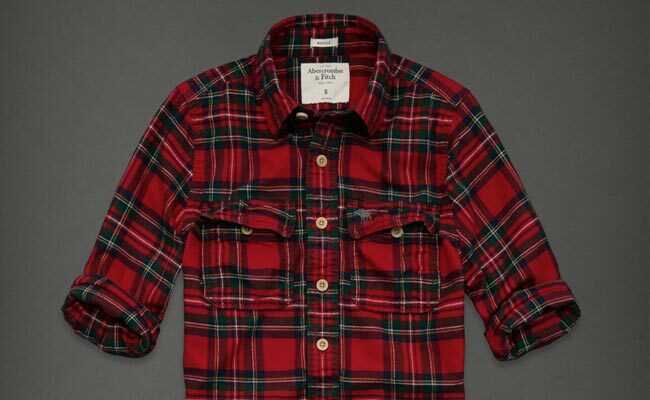 Large men should keep away from baggy excess and busy design. Slot pockets and bolder lapels will help, and be cautious of pea coats and double breasted varieties – a single-breasted military design will be far more accommodating but still offer a similar look. Skinny gents can neutralize their slight build by using intelligent tailoring; slimmer fits will avoid billowing, and chunkier topcoats like the duffle help give depth to the silhouette. 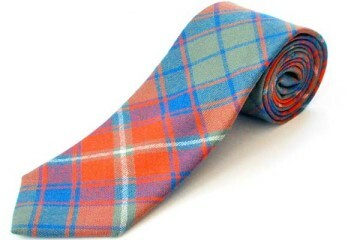 Some love cotton and some love wool, but never rule out the luxurious feel of silk and cashmere. 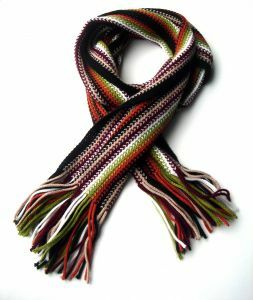 The humble scarf is oft overlooked, but will add untold comfort when standing around in an exposed bus terminal or train station. Length is all-important; if you have a thick or athletic neck, avoid short and slender weaves, otherwise the scale will appear too incongruent. The reverse also holds true – those with pencil necks should shun anything too long or too thick in order to retain an elegant poise. Should you find yourself unable to find the perfect length, try a different looping method – some knots will require more fabric than others. 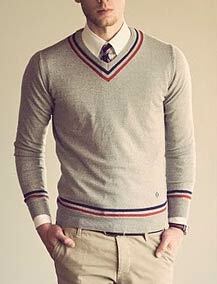 If I could change one element of a man’s everyday winter/fall wardrobe, the pullover would be top of the list. When done correctly, nothing looks as elegant and refined. As always, remember the golden rule: skim the silhouette! It doesn’t matter if you’re fat, thin, tall, short, waif-like or stocky – you want the fabric to hug you gently without riding up. The key to everyday sweaters is getting the perfect material. Avoid the cable-knit and grab yourself as much wafer-thin merino and cashmere you can afford; you get all the warmth with a fraction of the thickness. Just be careful when laundering your new jumpers – thinner textiles are far less forgiving than poly-cotton blends. Try to buy a selection in neutral tones: grey is a given, as are black and navy. If you want to step outside the box, you might want to consider a deep plum or claret too – you’d be surprised at how well their dusky, rich tones sit against most business wear and most skin types. As always, you should consider supple leather your best friend; those with moral objections (or shopping on a strict budget) should try artificial alternatives. Remember, ski gloves are for the Alps, not the city streets! 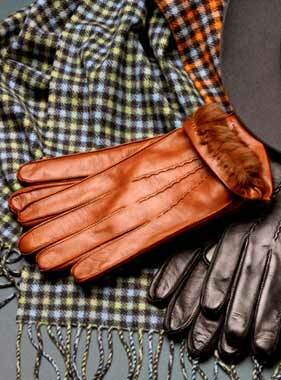 If you don’t already own a pair of leather gloves, there are only three shades worth considering: black, tan and grey. Don’t forget to buy a warm, yet thin lining to avoid the ‘cotton mitts’ effect and commit to memory the following mantra: “One size NEVER fits all” – always give gloves a test run before purchase. A pair of dress boots will save you from the horrible sensation of slush soaked ankles post snowstorm; plus, if you’re wearing your trousers with the correct break length, few at the office should even note you’re wearing dress boots at all. 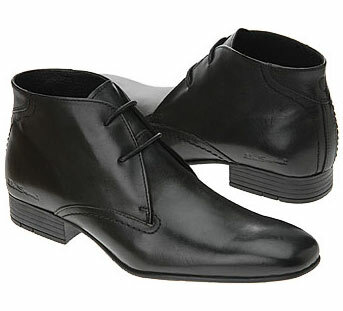 Note you’re after a slim, tailored finish, so put those clompy ‘horse’ boots back on the shelf right now! Simple and unfussy beats square-toed monstrosities every day of the week. Just be sure your pair offers adequate arch support and a study sole that won’t break after a single season’s use. awesome post! But one question ; where can I get the sweater in the picture? Can you please tell me where can I get the sweater from?